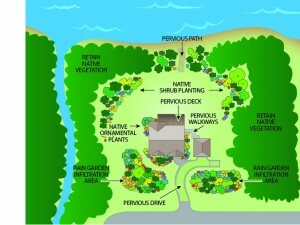 Nature can play an important role in protecting your property. By working with nature you can decrease property maintenance time and cost, provide protection from natural forces (i.e., waves, flooding, etc. ), help clean polluted water, and provide habitat for native wildlife. Tree Owner’s Manual – National Edition, 40 p, USDA Forest Service, July 2010. Cass Turnbull’s Guide to Pruning, 3rd Edition, Cass Turnbull, 384 p., Sasquatch Books, Nov. 2012. The most beautiful views in Washington State can be found on or near the Puget Sound shoreline. Attempting to maintain these views are one of the main reasons people cut or top trees. Cutting and topping trees can cause bigger problems than they solve. Alternatives are available. Trees help stabilize the land. Roots hold sand and soil in place, as well as take up large amounts of water that may otherwise flow down the face of the slope. Leaves and needles intercept and slow rain as it falls to the ground. These both help minimize the effects of erosion and the potential for slides. Trees, shrubs, and groundcovers help prevent some invasive plant species from becoming established. Removing the top or crown of the tree lowers its vigor and leaves it susceptible to various diseases, funguses, and insect harm. This can ultimately lead to tree mortality and blowdown. Topping can also activate branch buds causing multiple shoots to pop up quickly below each cut in the tree’s effort to regain lost energy. The shoots can reach the previous height within two years, requiring continuous topping and associated dangers. When it is absolutely necessary to prune a tree to preserve a view, there are a few recommended alternatives that cause the least amount of harm to the tree including windowing, interlimbing or skirting up. It is best to hire a professional arborist who has a trained crew with required safety equipment and liability insurance. This is especially good advice when working with tall trees or near a bluff. An arborist should be certified by the International Society of Arboriculture (ISA). Consider asking for bids, using the American National Standards Institute (ANSI) A-300 National Tree Pruning Standards. That way you are covered against damages and can compare bids easily. Remember that most local governments have some restrictions about tree removal within a buffer zone and there may be other restrictions including homeowner association rules or covenants. 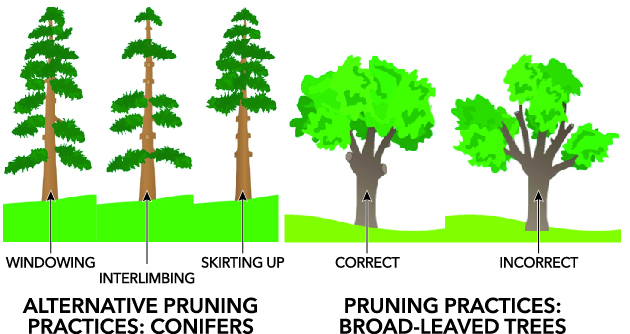 There are big differences in how to prune a conifer and a broad-leaf tree. It is important when pruning a conifer, to retain at least 60% of its crown to keep it healthy. When conifer limbs are cut to open a view, that view will always be preserved, as the limbs maintain the same distance from the ground as the tree grows. When the tree increases in height, the growth is always at the top of the tree. The trunk may increase in girth, and the limbs may become thicker and longer, but they maintain the same height from the ground. 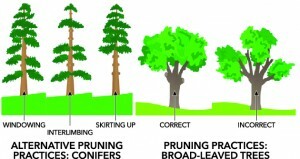 Pruning of broad-leaf trees is time-consuming and difficult because they can re-sprout easily. Another great way to use nature for your benefit is to collect rain to water your landscaping using rain cisterns. Rain gardens or permeable paving choices that allow water to flow through into the soil rather than run off the surface help to keep pollutants out of our waterways. These techniques are discussed in more detail in Guideline 4. 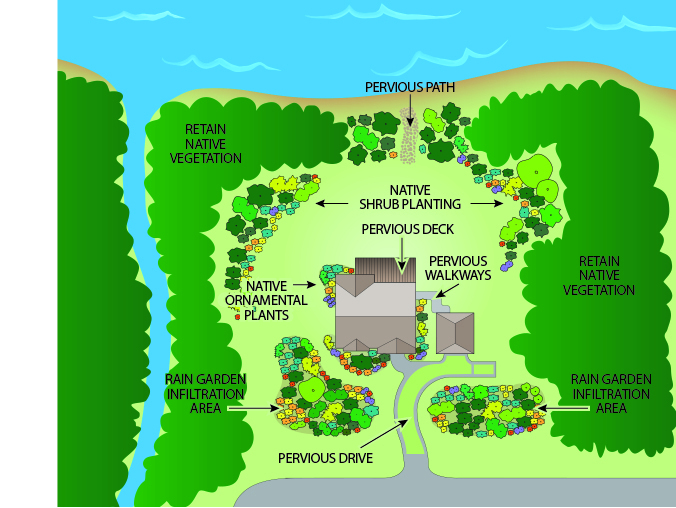 One of the ways you can put nature to work is to maintain a buffer of native vegetation along your bluff or shoreline. Buffers provide a transition between aquatic and upland areas and provide a number of important benefits to you and our waterways. Vegetation helps stabilize slopes and bluffs, and can calm heavy wave action, reducing the need for expensive bulkheads. Along streams, the vegetation in the buffer can help prevent erosion and slow damaging floodwaters. 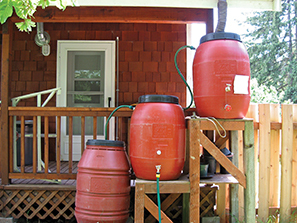 Healthy buffers can protect water quality by filtering out sediment and pollutants such as nitrogen, phosphorus, heavy metals, pesticides, harmful bacteria, and other pathogens common in runoff from streets, homes and agricultural areas. Buffers also provide shade, food sources, and habitat for birds, fish, wildlife and essential insects such as pollinators. Buffers require little in the way of irrigation or maintenance once the plants are established. 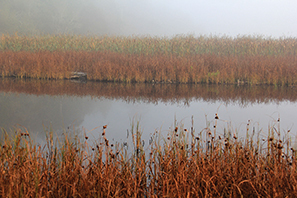 Additional information on shoreline buffers can be found in Guideline 5 and on streamside buffers in Guideline 6. Maintaining a buffer is not only important in protecting your property, but is also required by current regulations. See Guideline 10 for details on permitting and the Shoreline Management Act, which covers Washington’s marine shoreline and rivers and lakes. Streamside buffer requirements are discussed in Guideline 6. Nature can work for you! By working with nature you can cool your home, save energy, provide privacy, reduce your water bill, save time, avoid introducing invasive species and increase bird and wildlife activity. You can also prevent erosion and water runoff. Many Shore Stewards find that with careful site planning, nature can provide all of these things, inexpensively and attractively. By observing and understanding your property you can begin to design with nature, taking full advantage of the benefits it provides. For example, if you keep trees like big leaf maple, vine maple and bitter cherry on the south side of your house, your home will be shady and cool in the summer. Dense existing vegetation can maintain your privacy and provide a screen from future development on neighboring properties. Dead trees or snags can be attractive and will provide homes for many birds such as woodpeckers, flickers, osprey, and bald eagles. Keep them if they are not a hazard. Carefully planning pathways to the beach can prevent erosion. Maintaining your views can be accomplished by carefully pruning limbs, instead of cutting down or topping a tree. You might start by drawing a simple map of your property. Note where your home is and any paved surfaces, driveways and paths. Show the slopes, where water is and how it moves through your property, the soil conditions (clay, sand), and existing trees and shrubs and special views. Once you have your map you will start to see ways to work with nature. Observe your property over a few months to see the conditions in your yard. This will help you decide which plants would thrive on your property. Some plants do best in full sunshine, others prefer shade, and some work well anywhere. One plant might prefer dry locations, and another likes areas that remain moist. If you haven’t built your home yet and your land is not cleared, you have even more opportunities to work with nature. One of the best ways to get nature working for you is to simply keep existing soils and native plants, shrubs, and trees. If you retain what you have, you’ll save money, because buying replacement plants and trees can be expensive. 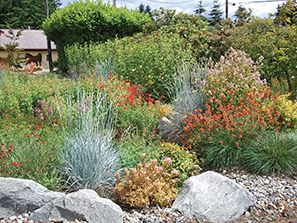 You can reduce your water use, because established native plants are adapted to our dry summers. When you clear vegetation you open that area up to erosion and invasive weeds. For more on native plants see Guideline 3. If you hire a contractor to do work on your land, make sure they understand your wishes regarding clearing. Mark the areas you want to protect. Walk the land with your contractor to agree on which trees should be protected. Heavy equipment damages tree roots and compacts soils. Compacted soils inhibit plant growth and leads to ponding of water because the pores in the soil are gone. Most trees will likely survive if at least 60% of the root system is unharmed. Keep ground disturbance at least as far out as the drip-line (outermost circumference of the tree canopy). Ask your contractor how the trees will be cleared. The quickest way is to scrape them away with a bulldozer, but using a chainsaw will protect the surrounding trees better. Clearing on a bluff or slope has special considerations due to the hazards of landslides. If your property is located on a bluff, you may want shoreline access, whether by trail or stairwell. Sometimes it is easier and cheaper to share shoreline access with a neighbor, or use a community access nearby. If not, look for a natural trail to the shoreline along durable surfaces, or if you have room, design a trail that meanders, rather than going straight down to the beach.